In a batch of old music magazines I borrowed a while back, I came across a few issues of a long-out-of-print periodical called “Sounds”. “Sounds” was a large format publication, printed on newsprint (like those old Rolling Stone magazines). It differed from a lot of other music mags by way of it’s writing. There were some vicious, but sometimes very funny, writers writing for “Sounds”. 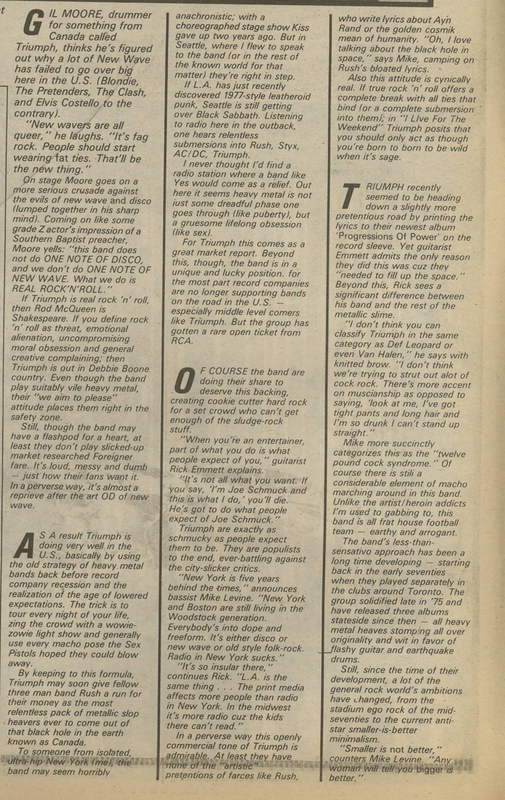 The 1980 article below, about hard rock band Triumph, is a case in point and just plain fun to read. There was no fawning rock-god worship here! (Disclaimer: I think Rik Emmett was and is a fine guitarist and seems like a good guy when I’ve seen other interviews with him, even if Triumph’s music had questionable artistic values from time to time). (You’ll have to click on the article to make it larger and readable. Even then, it’s still a little small…sorry).